The past year has been defined by peaks, troughs, and nowt in-between, but in early December I got to take my first true holiday in nearly three years. Prague during its Christmas fair was a beautiful thing, and while we spent much of our time there drinking mulled wine in the freezing cold, I did get to visit two great museum exhibitions. I’ve always loved Alfons Mucha’s art, and it was great to finally see large lithographs of what are arguably the origins of modern comic book art. The second exhibition was at the Kafka museum, which affected me in a profound manner that I wasn’t quite prepared for. I guess I came away from those few hours immersed in Kafka’s misery wondering if it was all worth it. I also saw some painful parallels between his life, or rather the way he approached life, and mine. Yes, I’m that ostentatious. Also, I guess this is what happens when you hoard thousands of comics and books. Seriously, up until yesterday I had kept every comic and children’s annual ever given to me. That’s not a healthy way to live, and I’m genuinely considering making the gradual move to digital. 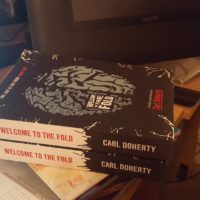 Yes, Welcome to The Fold will be getting a physical release, and a long overdue move beyond Amazon exclusivity. I’ll be publishing a 4,000 word short story, To See Beyond the Skyglass, next month at the latest. It’ll be super cheap on some ebook platforms, and free on others. I’m going follow this up with an attempt to push beyond my fear of collaboration with a comic anthology, Three Short Stories About Depression, later in the year, though I’ll probably publish each page on Shelf Abuse as and when it’s done. I’m also applying for an Arts Council grant to develop a “top secret” comic book project. In other words, I won’t embarrass myself by announcing it until I know the outcome. Vegan(Vn) will hopefully see release at the end of 2018. It all depends on whether I can get through the year without complete upheaval compromising my schedule. However, the first few chapters will be available early into the year, in some naive effort to generate positive buzz. Tales from The Fold won’t be happening until 2019, if then. I’m not done with Harvard Standt yet though, hell no, he and I just need to spend some time apart. I’ve noticed that more and more people are visiting the Bothersome Books website and Facebook page, so I’ll endeavour to post monthly updates from now one. Because I’m also well-aware that the world is thoroughly invested in everything I do and eagerly awaits my every announcement.